Pangu’s jailbreak for iOS 7.1.x is working awesome on all iOS devices supported to it. But it’s the common issue with jailbreak that there are some apps and tweaks available in Cydia that make the jailbreak useless, because they are filled with bugs. I’ve re-installed pangu’s jailbreak three times on my iPhone 5 running iOS 7.1.2. If one has paid for apps and tweaks in his/her Cydia, then all those tweaks’ data will be removed when iPhone will be restored on a newer iOS version. After jailbreaking again, one will have to purchase those tweaks, apps and utilities to use them again. It’s essential to backup all your data before restoring your iDevice, so you’ll be able to restore that backup when you’ll again jailbreak your device. 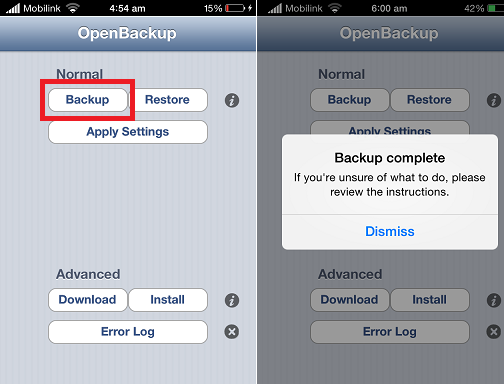 This article will help you to learn the way to backup and restore your jailbreak data step by step. To accomplish this backing up goal, we’ve to install OpenBackup utility first. Step 1: Go to your Cydia store and search for OpenBackup, and install it free. Mostly backup utilities are paid in Cydia, but OpenBackup is free. Step 2: Login to your iCloud account, before starting the guide, all your tweaks data will be saved in your iCloud but you wouldn’t be able to see that. If you don’t have iCloud account then set it up. Step 3: Now go to OpenBackup utility, make sure you’ve an internet connection, from the available options tap on Backup button and after few minutes you’ll see a popup notification with this message “Backup Complete, If you’re unsure of what to do, please review the instructions“. Your tweaks, apps and utilities are backed up now to iCloud successfully. Tap on “Apply Settings” button and you’re done with the backup process. Note: The backup process will take some time according to the size of your jailbreak data. 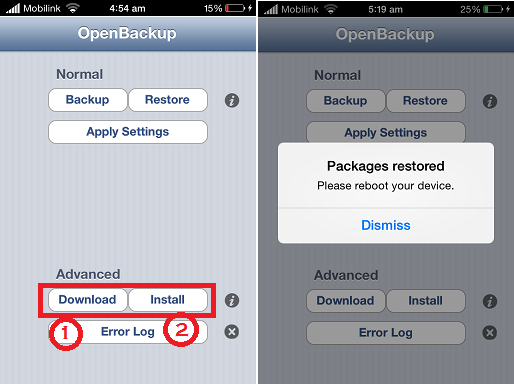 Step 1: After jailbreaking your device, you can restore your data that was backed up using the above method. To do this, install the OpenBackup utility again and open it. Step 2: Login to your iCloud with the same Apple ID, by which you’ve taken the backup. Go to OpenBackup and from the Advanced tab, tap on Download button and after the completion of download, tap on install button. Hurray! you’re done with the whole process. It’s essential to take backup of your Cydia data because if you’ve paid for that, you’ll lost all of your money in case of failure to backup. Currently I found this utility free of cost and user-friendly, if you’ve any other then let me know via commenting on this article.